This article is about airburst explosions. For earthquakes and underground explosions, see Hypocenter. For other uses, see Ground zero (disambiguation). In terms of nuclear explosions and other large bombs, the term "ground zero" (also known as "surface zero") describes the point on the Earth's surface closest to a detonation. In the case of an explosion above the ground, ground zero refers to the point on the ground directly below the nuclear detonation and is sometimes called the hypocenter (from Greek ὑπο- "under-" and center). Generally, the term "ground zero" is also used in relation to earthquakes, epidemics, and other disasters to mark the point of the most severe damage or destruction. The term is distinguished from the term zero point in that the latter can also be located in the air, underground, or underwater. In mapping the effects of an atomic bomb, such as on the city of Hiroshima here, concentric circles are drawn centered on the point below the detonation and numbered at radial distances of 1,000 feet (305 meters). This point below the detonation is called "Ground Zero". The origins of the term "ground zero" began with the Trinity test in Jornada del Muerto desert near Socorro, New Mexico, and the atomic bombings of Hiroshima and Nagasaki in Japan. The United States Strategic Bombing Survey of the atomic attacks, released in June 1946, used the term liberally, defining it as: "For convenience, the term 'ground zero' will be used to designate the point on the ground directly beneath the point of detonation, or 'air zero.'" William Laurence, an embedded reporter with the Manhattan Project, reported that "Zero" was "the code name given to the spot chosen for the [Trinity] test" in 1945. The Oxford English Dictionary, citing the use of the term in a 1946 New York Times report on the destroyed city of Hiroshima, defines ground zero as "that part of the ground situated immediately under an exploding bomb, especially an atomic one." The term was military slang, used at the Trinity site where the weapon tower for the first nuclear weapon was at "point zero", and moved into general use very shortly after the end of World War II. At Hiroshima, the hypocenter of the attack was Shima Hospital, approximately 800 ft (240 m) away from the intended aiming point at Aioi Bridge. Panoramic view of the monument marking the hypocenter, or ground zero, of the atomic bomb explosion over Nagasaki. 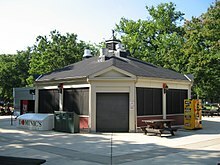 The former hot dog stand nicknamed Cafe Ground Zero in the Pentagon's center courtyard. During the Cold War, The Pentagon, the headquarters of the United States Department of Defense in Arlington County, Virginia, was an assured target in the event of nuclear war. The open space in the center of the Pentagon became known informally as ground zero. A snack bar that used to be located at the center of this open space was nicknamed "Cafe Ground Zero". Aerial view of the World Trade Center site in September 2001. 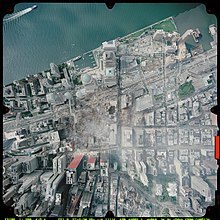 During the September 11, 2001 attacks, two aircraft hijacked by 10 al-Qaeda terrorists flew into the North and South Towers of the World Trade Center in New York City, causing massive damage and starting fires that caused the weakened 110-story skyscrapers to collapse. The destroyed World Trade Center site soon became known as "ground zero." Rescue workers also used the phrase "The Pile", referring to the pile of rubble that was left after the buildings collapsed. The World Trade Center site, as it appeared in October 2004. 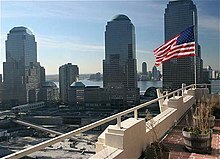 Even after the site was cleaned up and construction on the new One World Trade Center and the National September 11 Memorial & Museum were well under way, the term was still frequently used to refer to the site, as when opponents of the Park51 project that was to be located two blocks away from the site labeled it the "Ground Zero mosque." In advance of the 10th anniversary of the attacks, New York City mayor Michael Bloomberg urged that the "ground zero" moniker be retired, saying, "...the time has come to call those 16 acres what they are: The World Trade Center and the National September 11th Memorial and Museum." ^ "U.S. DoD Terminology: surface zero". Retrieved 28 November 2016. ^ "U.S. DoD Terminology: zero point". Retrieved 28 November 2016. ^ U.S. Strategic Bombing Survey: The Effects of the Atomic Bombings of Hiroshima and Nagasaki. June 19, 1946. President's Secretary's File, Truman Papers. Page 5. ^ William L. Laurence, Dawn over Zero (London: Museum Press, 1947), 4. ^ Hamill, Denis (16 September 2001). "Rescue Workers Keep Up Quest for Signs of Life Ruin All Over, But Not One Unkind Word". Daily News (New York). ^ Geoghegan, Tom (2011-09-07). "Is it time to retire 'Ground zero'?". BBC. Retrieved 2011-09-10.